High Definition Media Player Player - HDTV/DVD/VCD Software, MPEG/AVI/MOV Decoder. Cool DVD player dual-core version is a high definition media player which supports a wide variety of video formats. It can put the super computation capability of dual-core CPU into full play and the latest dual-core decoding technology makes your PC the perfect HD video and audio playback platform. Meanwhile, The HD DVD Player is a complete compatible media player and it can support a wide variety of video formats including HDTV, DVD, VCD, MPEG1/2/4, AVI, RM, MOV, MP3 etc. The HD DVD Player can be extensively compatible with hardware, which is operated stably, smoothly under Windows 2000\ XP\2003\Vista system. The HD DVD Player dual-core version adopts the advanced dual-core(multi-core) decoding technology, makes the perfect support to the multi-core CPU and become the perfect resolution in multi-core CPU time. Can determine disc type in the DVD drive automatically and choose the right play mode for DVD titles, video CDs, audio CDs or DivX/XviD Discs. Auto-resume and Bookmarks let you jump right to the last viewed location of DVD. The HD DVD Player dual-core version supports up to 32 roads subtitles. Playing window menu during playback-"subtitle selection" items list all the subtitles options provided by DVD and the position can be dragged by moving the mouse. Unique subtitles editor supports color changing, transparency, zoom, intelligent line break, subtitle boundary peaking, subtitle size adjustment, subtitle bright part edition and background part edition and subtitle precision processing. Powerful capture function: adopt BICUIC-BSAMPLE technology zoom freely, clear and sharp and it also can browse and save the pretty pictures from your favorite movie. Smart Stretch let you enjoy any movie with 16:9 aspect ratio on any screen mode, without distortion. Completely support VCD and DVD navigation. Powerful audio effect, completely supports AC3, DTS ,MPEG,LPCM and other encoding formats, also spectrum enhancement later effect added. Support 5.1/6.1/7.1 stereo. High precision/high performance double decoding mode, peaking process，multiple deinterlacing, clearest image. Powerful image color temperature adjustment function, including luma, contrast, UV chroma and saturation. An PC layer support background playback. Desktop Video enables you to watch DVD and work simultaneously! Complete wrong correction, Do the best from disk reading, disk navigation, decoding and playback. Many kind of playback software will be halted and lead the system to non-responding because of the low-quality and the bad track of the disc. The users will often meet those problems. The HD DVD Player dual-core version adopted the direct disc reading technology which can avoid the deadly reading, non-responding of the system and the exiting of the disc. The HD DVD Player dual-core version supplies Navigation/Directly play/playlist, 3 options in total. Directly playing can help you skip the redundant header of the movie. 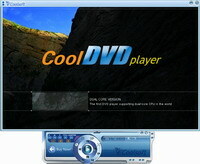 Many media players will breakdown if the navigation information is damaged, but CoolDVD player dual-core version can automatic switching to playlist mode to play the media file in disk, still could continue to play the movie. Maximize the probability of playing disk. Using player control dialog-general page to activate directly playing function. Peaking and several deinterlacing process make the image playback so clear. Super DVD image optimization offers high strength smooth playback by removing screen burrs and dithering. The HD DVD Player dual-core version supplies the senior options which can effectively reduce the virtual images phenomena and bring the precise, soft and exquisite image. New generation dual-core decoding technology, powerful HD video & audio playback platform, enjoyment of the attractive charm and the perfect effect of “Reverse-Hyper Threading”. The HD DVD Player dual-core version adopts the updated “Reverse-Hyper Threading” technology and makes the best support of the multi-core CPU. Major part of computation task of the player concentrates above the video decoder. The entire player is a multithreading, but because many factors limit video decoder works in a singlethreading. So on multi-core CPU system, the computation task cannot evenly assign to each core, thus it is very difficult to obtain the multi-core superiority. The HD DVD Player dual-core version》multimedia player supplies multi-core CPUs system. Generally the distribution of multimedia player's computation task on each filter isn't average, major part of computation task concentrates above the video decoder. The entire player is a multithreading, but because many factors limit video decoder works in a singlethreading. So on multi-core CPU system, the computation task cannot evenly assign to each core, thus it is very difficult for the sole player application to obtain the full capability of multi-core superiority. CoolDVD dual-core technology has conquered above question completely. The HD DVD Player dual-core version internal video decoder can do dynamic creation of decoder thread according to the counts of CPU. Push every video frames into a stream line cache system, through the complex data relevance judgment, will calculate and dispatch the duty to each available CPU. The dual-core CPU operation ability thus take effect, its computation ability is even equal sum of to the each CPU computation ability. Namely the double core 3G system is equal on the whole to single core 6G. This enhancement is astonishing, for example Cool DVD Player dual-core version can do the soft decompression of MPEG-2 pair of road 1080i (1920*1080) on the dual-core system, or single-channel 1440P (2560*1440), or single-channel H.264 - 1080i (1920*1080). Applying The HD DVD Player dual-core version to any dual-core laptop, 1920X1080i HD programs can be played smoothly. While the configuration of any computer or DIY computer is superior to the laptops, there will be no problem of hardware to play the HD programs.